Claude SAMARD POLIKAR is an explorer of musical landscapes. Over the years he has traveled successfully across many diverse musical territories as a musician, arranger, producer and film composer. Claude holds a Masters Degree in French Literature from Grenoble University-France and is a graduate of Berklee College of Music, Boston USA. He started his professional career as a studio musician specializing in guitars and related stringed instruments from around the world including 6-string guitar, 12-string guitar, pedal steel guitar, oud, banjo, dobro, bouzouki and many others. Claude is also an accomplished arranger with several gold and platinum credits to his name. His recordings include work with artists from the 5 continents : Midnight Oil, Patricia Kaas, Jean-Jacques Goldman, Roger Hodgson (Supertramp), John Wetton (Asia), Manu Dibango, Billy Preston, Justin Hayward (Moody Blues), Jon Anderson (Yes), Zucchero, Anggun, Jean Michel Jarre and Alan Simon (Gaia , Excalibur) to name just a few. Claude’s versatility and expertise in state-of-the-art digital technologies and electronic music since the late 70's led to him accepting the position of Musical Director and musician for electronic music pioneer Jean Michel Jarre, a position Claude has held since 2004 (first concert in Beijing Forbidden City) for more than 150 international concerts around the globe. 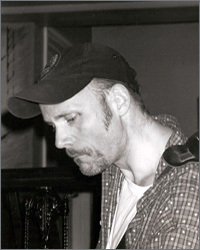 This, combined with his experience with organic and acoustic music from different cultures around the globe, evolved quite naturally into producing and composing music for picture (Koka/Universal, FLE libraries) for film and more personal projects. Claude’s latest album "Horizons", his previous album "Unplugged Journey" (Koka-Universal) and his work as producer of “A Journey In The Steppe” (Buda-Universal) by acclaimed Mongolian overtone singing artist Okna Tsahan Zam are but a few examples of this blend of organic and electronic sounds which has become Claude SAMARD POLIKAR’s indelible trademark. These and other albums composed, arranged or produced by Claude have been adapted many times for film, including synchronization for documentaries and commercials. Claude SAMARD POLIKAR’s unique compositional versatility led him to involvement in far-ranging projects like scoring UbiSoft’s runaway international video game hit Rayman as well as composing reggae songs for Rita Marley (Bob's wife). But it is in working with film directors that his talents find their most complete medium of expression. His first movie soundtrack "Bo Ba Bu" (Directed by Uzbek Ali Khamraev) won the Best Music Award in 2001 at the Shanghai International FIlm Festival. “The folk music of central Asia and modern music are beautifully blended in BO BA BU” was the Jury's comment. He recently worked for Maxime Alexandre on "Holy Money" (2009) and with Max Sender on "Christopher Roth" (2010 - voted Best Music at Sao Paulo-Brazil 5th Cinefantastic Festival). Claude SAMARD POLIKAR has also written a "digest" history of the guitar as well as several articles devoted to world guitars. These authoritative writings are often consulted via Claude’s internet pages by aficionados of guitars of the world located on several continents. He works primarily out of his own Studio 124, recently upgraded with a new SSL Matrix board, located facing the Seine river in Paris that features the best of hi-tech and vintage equipment. He s still working for Jean Michel Jarre , 2013 concerts in Carthage (Tunisia) and Sotchi (Russia) for the Olympic Games. Personal projects rojects range from cutting-edge hi-tech electronics to more traditional acoustic and electric sounds, for theater, TV series, music for picture (Cezame/FLE), film and a 2 new personal studio CD projects : one called "Electro lift" to be and another one mixing Chinese traditional and western urban styles, released early 2014 by Cezame Music Agency, available online (iTunes, Amazon, Deezer...).